Every tech transfer office knows its role is largely one of service to faculty, assisting researchers in moving their innovations through the commercialization pipeline. Typically, this means the researcher sees the TTO as an ally and advisor, often assisting with everything from disclosure to patent to start-up creation and funding. But, the feelings of “we’re in this together” can quickly turn sour when it comes time to negotiate licensing terms or the university’s equity stake in the start-up. And it can get downright nasty when things get real in term of money, leadership, control, and exit. Many universities rely on boilerplate contracts for ease, quickness, and transparency, but start-ups are as unique as the inventions they are founded upon. And, while some terms and conditions are prime for cut-and-paste, this overall approach brings great risk of misunderstandings that can lead to bad blood and costly litigation. 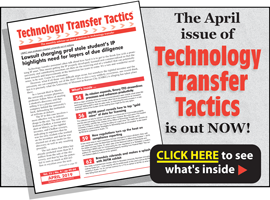 That’s why Technology Transfer Tactics’ Distance Learning Division is teaming up with K. Lance Anderson, attorney with Dickinson Wright PLLC, for this important webinar: Preventing Legal Disputes with Faculty Start-Ups: Drafting Agreements that Avoid Future Conflicts, scheduled for April 4th. For complete program details or to register, CLICK HERE.